The World famous cave of Lascaux with the huge and dramatic paintings of bulls has been captivating children ever since it was discovered. The cave was in fact discovered by four young boys in September 1940. Today, thousands of people visit the Vezere Valley each year to see the many other equally spectacular archaeological sites or simply to enjoy a family holiday in one of finest regions of France. 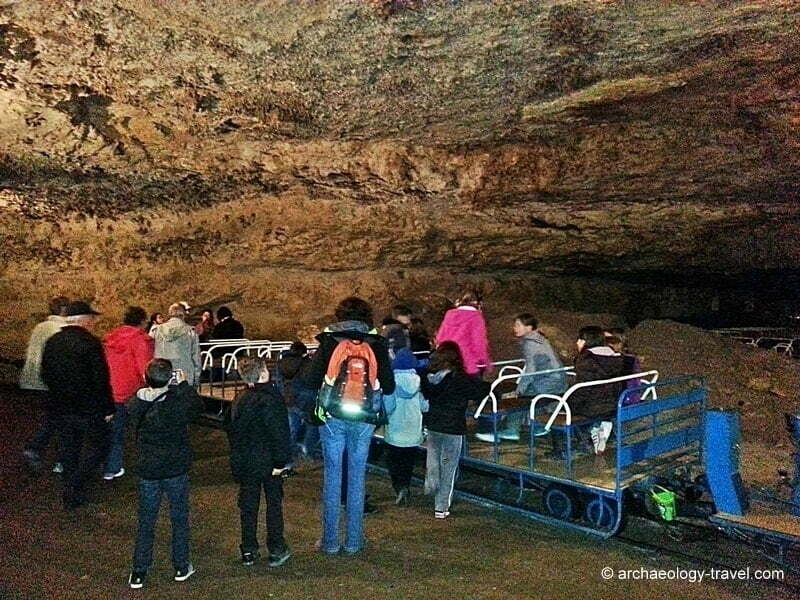 Visit a few of the painted caves in the Dordogne during a school term and chances are you will bump into a group of children on a day out. Most children love the caves, and for all sorts of reasons. 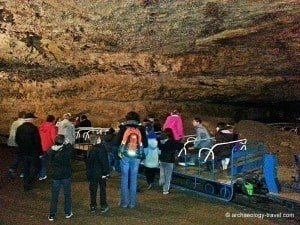 But the caves are not just good for school trips, they really are attractions of interest that can appeal to the whole family. Visiting the right ones can be a great adventure, the wrong ones will leave children bored, cold and fractious. There are a number of caves in the Les Eyzies area that are still open to the public, but not all are suitable for all children whereas others are particularly attractive to children. Le Thot’s reproductions from Lascaux. The art in these caves is thousands of years old and consequently it is quite fragile. Some caves are therefore closed to the public altogether, whereas the number of visitors is monitored closely and restricted at others. So, getting a ticket to these more restricted-access caves can be difficult especially during peak holiday periods. Sadly, or rather annoyingly, the ticketing arrangements for some of the decorated caves is archaic and frustrating. 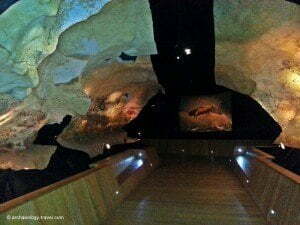 And this is particularly noticeable for the more popular caves such as Lascaux II, Font de Gaume and Les Combarelles. Pech Merle, although not in the Vezere Valley, shows it does not need to be like this (see the Pech Merle page for ticketing information). Tickets for Font de Gaume and Les Combarelles are only available on the day from the ticket office. As visitor numbers are heavily restricted, to get a ticket you have to get to the ticket office early. And in June the queue is already forming two hours before opening (9.30 am). Anyway, as spectacular as these cave area, they are probably more suited to older children and adults with a specific interest in cave art and prehistory, perhaps not for young children. Added excitement of an electric train into the depths of the cave. Getting tickets for Lascaux II is considerably easier (for full details, see the Lascaux II page), and the site is well worth a visit. The suspense of the queue before getting to the hall of the bulls with the enormous paintings really does leave young children looking up in awe. Although it is a replica, it was designed in such a way as to replicate as much of the experience of going into the original cave of Lascaux as possible. But it is an easy and a safe visit, with minimal steps and an even floor. And of course the story of the discovery by four boys and their dog Robot only adds to the adventure. By far the most exciting cave for families with younger children is Rouffignac. It is a massive cave with a floor that is mostly sticky clay. This and because the remarkably clear depictions of mammoths and other animals are a considerable distance into the cave led the owners to install an electric train in 1959. Not only does this make the visit an easy one (about an hour long), children love the train ride through the cave to the paintings – a ride that passes by prehistoric bear pits. Being on the train has the benefit of not standing around for the length of the visit – as is the case at the other caves. At the end of the line, visitors get off the train and stand beneath a wonderful panel of clearly visible, black outline paintings of horses, bison, mammoths and other animals. Some of the many animals at Le Thot. Besides the decorated caves there are a number of theme parks in the area that compliment the experience of seeing the Ice Age art. I recommend two: Le Thot and Le Grottes du Roc de Cazelle. 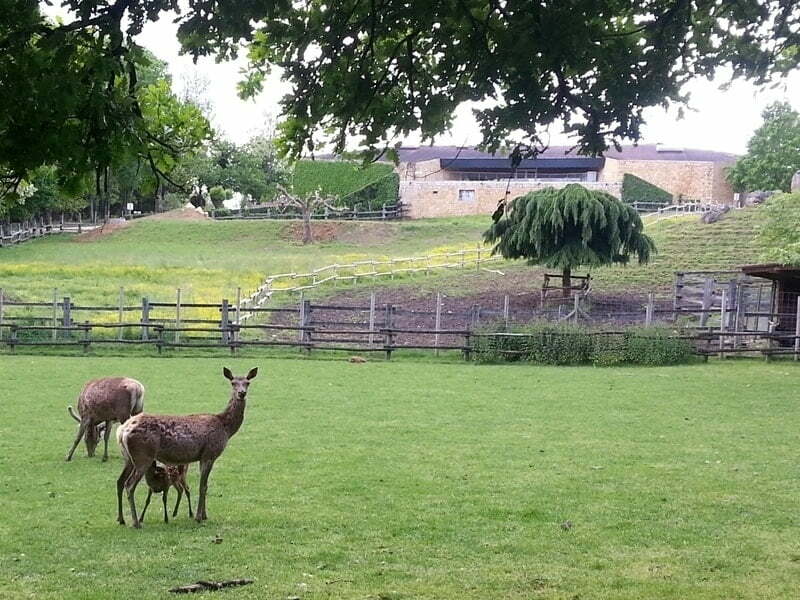 These two are each quite different and both add to an experience of prehistoric life in the area in different ways. Le Thot has both a museum and a park. Pride of place in the museum is the set of life size reproductions of some of the panels in Lascaux. A series of dioramas then give an impression of how the paintings were made. 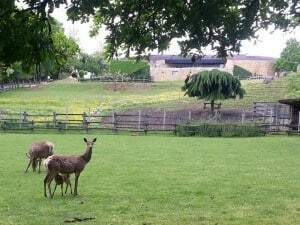 Our appreciation of the cave art, especially of the animals depicted, is further enhanced by the variety of live animals in the park. At Cazelle a series of rock shelters in the limestone cliffs typical of the area have been excavated by archaeologists, who have recovered many artefacts dating back some 12,000 years. Now, in these shelters the artefacts form the focal point of a series of dioramas depicting Stone Age life in the area. These include, amongst others, various aspects of daily life in prehistory such as how fire was made and how animals were hunted. The rock shelters in the limestone cliffs were not only used by prehistoric Stone Age communities many thousands of years ago, but also more recently by Medieval people. The site of Cazelle was occupied from Medieval times right up until 1966. 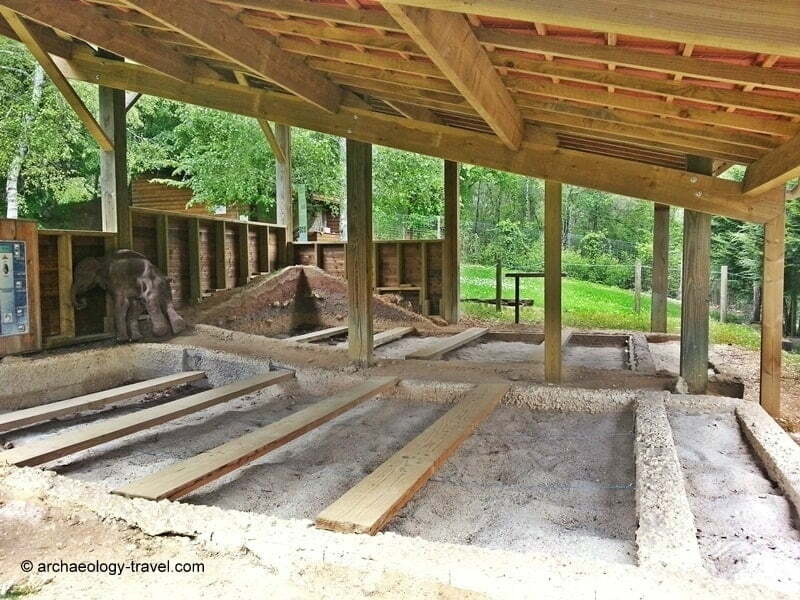 The remains of this medieval farm have been reconstructed and provide a good idea of how later, Medieval communities also used these shelters. Temperatures in the caves are fairly constant throughout the year, between 11°C and 13°C, and humidity levels are quite high. The caves are dark, even with electric lighting. Bags and backpacks, food and drinks, are not allowed inside the caves. Access to all of the decorated caves is only possible on a guided tour – most of these last between 40 minutes and an hour. Most have toilet facilities, at or near the entrance. And remember, the paintings and engravings on the cave walls are old, very old, ensure your children do not try to touch them. Heading off to the Dordogne – enjoy your trip and be sure to return and share your experience. If you have already been, post your tips and advice in a comment below. A pit for aspiring archaeologists. See the definitive Guide to Cave Art in France. Do you have suggestions in the Charente region in france? There are not many decorated caves open to the public in the Charentes region. Two that are open, south east of Angoulême are Grottes de Villars and Grotte de Teyjat. Teyjat is more substantial (with a very good museum) than Villars. I’m dying to visit some of these caves but I haven’t been able to make it to France yet. The sites are really remarkable examples of prehistoric art and I can only imagine how stunning they are in person. Great article! I’m even more desperate to visit them now!